What are the Biggest Problems with Cadavers? When it comes to life-threatening surgical procedures, it’s helpful to have accurate anatomical models to practice on — hence why we use cadavers. The tradition of using cadavers in modern western surgical practice dates back hundreds of years and has helped develop the foundation of what we know about human anatomy today. For this reason, it is no wonder first-year medical school students still use cadavers to study and train in preparation for their work in the real world. Even trained surgeons use them at sponsored courses on new surgical techniques. However, using cadavers does have some drawbacks to consider on both the individual level and for the institutions which procure them. 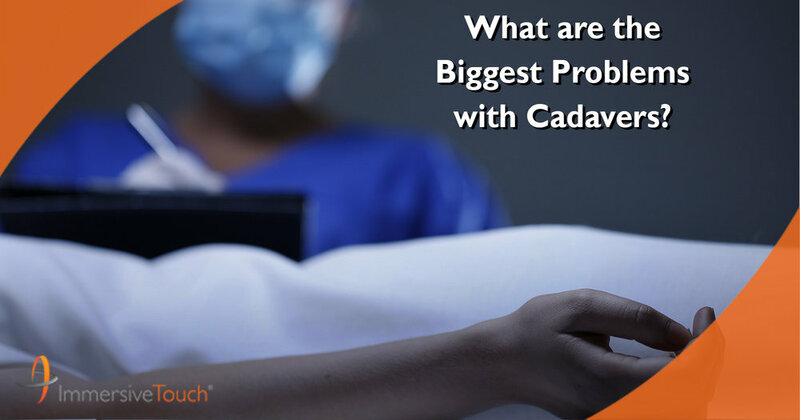 Cadavers’ wide use doesn’t mean there aren’t issues with how they are obtained. There’s a cottage industry that has proliferated from the sale of both intact and cut cadavers for science or research. Since there are no laws against buying human body parts in most states, this can sometimes lead to shady deals to unknown buyers making huge profits. The ethical issues of getting cadavers unfortunately don’t stop at the individual level. This loosely-regulated industry also has a problem on the buying end where it’s not always known precisely where donated cadavers come from — and many prefer not to ask. With an industry fraught with deceptive and questionable practices, you begin to wonder if there is a better way for medical students to learn. There is a reason an industry has bloomed out of human body research — cadavers are expensive. A single intact cadaver can cost about $1000, but that’s for a one-time use. Individual body parts can vary in price and fees, for example a single head can cost $500. This may seem reasonable since this is a person’s body, but if you calculate across one promoted course for surgeons with a hundred or more students per class, it starts to add up. The added cost of cold storage and freight to labs with cadavers makes this a pretty expensive learning tool for medical device companies and universities alike. Formaldehyde is a gas that has been used for decades in mortuaries to preserve bodies for display or research. Even though the funeral industry stands behind the chemical despite its categorization as a carcinogen, that doesn’t mean formaldehyde is the best option. The gas has been shown to cause eye irritation, work-related bronchial asthma, and other immediate symptoms when students are working with cadavers. The long-term effects are still being explored, but higher rates of rare cancers have been found in studies conducted on workers with high exposure to formaldehyde. The chemicals used to preserve cadavers affect everybody involved, so maybe it’s time to see if technology create a safer solution to training surgeons. A cadaver is basically a hunk of meat, so when a medical student or a surgeon in a CE course is working on one, the only way to gauge their work is based on the eye of the instructor, which is of course subjective. This is especially true with newer techniques and medical devices, as the practice isn’t yet solidified by decades of experience. A software-based surgery simulation could score trainees based on precise movements and deviation from them, allowing an objective picture of performance to be taken. Cadavers give trainees a crack at practicing on a real body before entering an operating room with a live patient, but the price, dangerous chemicals used, and the shady practices of the cadaver industry begs to ask if there isn’t a better way. Virtual reality (VR) technology is a promising venture that could completely replace the cadaver in the classroom. Simulations using real MRI data and tactile feedback can not only provide endless practice for students, it can also create infinite possibilities of different scenarios of surgeries that would otherwise take hundreds of cadavers. While it is likely that a cadaver will always have its place early in medical student’s training, it benefits the world, the students, institutions and medical device makers to seek out new methods to supplant them, until maybe they can ensure a more safe and ethical way to use them in medical CE training.